Learning a foreign language can be a difficult thing for anyone, but if you want to teach your child to speak and learn the English language, then find some fun ESL listening activities for children that make learning enjoyable. Activities make learning more fun and they can be especially helpful for children who tend to be auditory learners as opposed to visual learners, or in situations where words are spelled differently then they sound. If you remember back to your days in grammar school there were probably activities that you always looked forward to in the day's schedule. For many students, the most enjoyable activities include singing time or story time. Both of these engage the student in what they are doing and the learning process slips to the back of their mind. They are just having fun and not trying to learn at that point in time, so learning will be effortless. Using singing with students allows them to have fun and pick up the words as they sing the song. You will help increase the attention span of the student and increase the retention of the material. Adding hand movements to the song or to words within the song helps the child connect to the words. The method of repeating the song many times throughout the day is tolerated by children quite well. Turn the song into a round and play with the children as they learn it. One variation on this theme is to play a game where each student says the next word in the song as you work your way around the room or around a circle. This makes the student concentrate and follow along with the song as it progresses so that they know both when it is their turn to say a word and so that they know what word comes next. This can be a very fun experience for the children if you build a small set of songs that you can sing together. 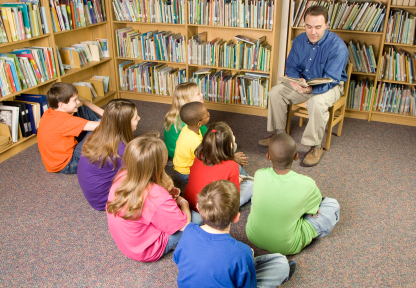 Tell a story to the class so that they will initially listen in order to understand the story. Continue to tell the story for a few days. Begin to introduce new things to the story such as having one student act out a character in the story as you read it. You can use a felt board with figures as you tell the story and have the students animate the figures and follow what is happening in the story. After you have been reading the story for a while and the students know it by heart (which usually happens very quickly with children), have one of the children tell the story to the class. They can take turns and let others in the class make gestures or act out the action of the story. Tell the story in a mock quiz form by inserting something new or changing the sequence of events, pause during the telling, and ask them if this is right. Use the interaction to help them practice listening and responding. Be creative with the story concept. Make up cards with pictures of things in the story and pass them out. Have the students hold up their cards when you read the part of the story that has the object on their card. By listening to the story and thinking about it, you will work on the student's listening ability. When working on ESL listening activities, repetition is often the key to success. The more children hear vocabulary words and are able to associate them with objects, the easier it is for them to remember the words. Begin using the new vocabulary words from the stories or songs with them in classroom activities. Change the story and have them listen for the new characters. Ask questions about what happens in the story to recreate it from their comments. In many ways, teaching children a new language is easier than teaching adults. English is a hard language to learn as a second language, and to avoid the frustration that children might feel when learning it, it is important to keep the activities fun and interesting. "ESL Listening Activities for Children." YourDictionary, n.d. Web. 22 April 2019. <https://esl.yourdictionary.com/lesson-plans/esl-listening-activities-for-children.html>. Learning a foreign language can be a difficult thing for anyone, but if you want to teach your child to speak and learn the English language, then find some fun ESL listening activities for children that make learning enjoyable.Activities make learning more fun and they can be especially helpful for children who tend to be auditory learners as opposed to visual learners, or in situations where words are spelled differently then they sound.